Created for stressed-out skin by psychotherapist and fountain of skin knowledge, Charlotte Ferguson, DISCIPLE Skincare is perfect for addressing inflammatory skin issues, including adult acne, eczema and premature ageing. With Good Skin Day Oil and Dreamy Skin Night Oil, this duo is brimming with essential fatty acids, hormone-balancing essential oils and bad bacteria-fighting prebiotics to leave your skin clearer, nourished and more radiant. Clean, natural and sublime in its streamlined (seriously effective) simplicity, this set represents everything we love about DISCIPLE – prepare to be converted. 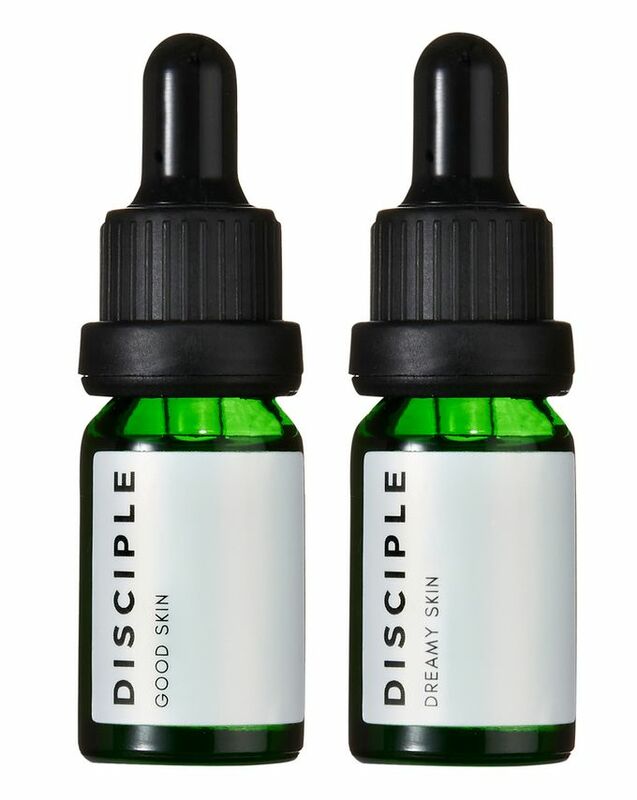 If you’re struggling with tricky, stressed-out skin, DISCIPLE Skincare’s day and night oil duo is the perfect solution. For day time care, there’s Good Skin Day Oil, which stars cucumber seed oil, potent ‘superfood’ turmeric oil and antibacterial geranium, oil. Formulated with breakout-prone skin in mind, this 100% active botanical face oil is rich in essential fatty acids, hormone-balancing essential oils and bad bacteria-fighting prebiotics to clear, brighten and nourish confused complexions. When it’s time for bed, Dreamy Skin Night Oil is a powerhouse treatment that’s rich in regenerating rosehip seed oil and age-defying retinyl. Helping to regenerate skin cells while you sleep, the formula reduces pigmentation, pore size and fine lines while boosting firmness. Perfect for acne-prone skin, the age-defying, anti-dark spot treatment corrects damage and boosts radiance for a firm, youthful effect. Gently massage four to five drops into cleansed skin morning and night. Pat around the orbital area. Can also be blended with your preferred hydrating cream, serum or gel to intensify hydration and break-out-busting properties*. Gently massage four to five drops into cleansed skin every night. Pat around the orbital area. Because of the regenerative powers of this treatment oil it is important to wear SPF sun protection during the day. I've tried many, many acne treatments; prescribed, homemade, drugstore, high end but nothing made a difference, at least till I found Disciple. Both oils leave the skin hydrated and plumped and not greasy. 90% of my breakout are gone after just 2 months of using these products. Absolutely give it a try, you will not regret it. My BFF raves about these two and decided to get them for my birthday. I can absolutely see why she loves them! Also the price point is amazing! Th night oil is herbal and very nourishing my skin glows in the morning. The good day oil I find quite light thankfully didn’t break me out even though the olive oil but it’s less than 0.5% so very small amount. Will definitely repurchase the night oil and probably the good day oil too! I received this in the Cult Beauty Goody Bag and a few drops left my skin incredibly balanced. I noticed how my skin became less oily when I used it. It didn't feel greasy at all and helped calm any existing breakouts. My skin was left glowing. I absolutely am in love and now adding the full size to my basket! Calmed down my temperamental skin within a week. A definite skincare staple for me. I have sensitive, acne prone skin. This leaves my skin soft and hydrated. Not only does it not break me out, but actually helps to reduce skin imperfections. Highly recommended! I have never used oil because my face was always oily enough. Since I heard it so much from the kit I wanted to try and I am happy with the result. I finished the kit and result is good but feeling is beyond perfect. I would actually love to write long review about the products. At the end of last year, my skin went to hell for some unknown reason. After trying everything, I decided to purchase these facial oils and OH MY GOD!!! They have changed my skin! I don’t break out as much, the scarring from previous ones have gone way down and my skin just glows - cannot recommend this enough!! So far so good, these products have both been really nice to use. My skin loves them and hasn't played up. Really loving these at the moment. I've used different creams for my hormone acne. It has mostly made my skin dry and irritated. These oils are great! They have made my skin so so much better. There's something to be said about putting essential oils on the face. One of these smells wonderful so I have started putting this on my wrists, however as a skin treatment. There are better products. Glad I didn't invest beyond the discovery duo. It minimised my pores and really helped my acne prone skin. Definitely buying more. It's 3 stars for me because I loved the smell and the idea of the two oils coming together at a very good price. I love the herbal/natural scent too, however, I don't think I noticed any miraculous results with the oil other than making the skill feel soft the following day which all the oils I've used so far do too. Such a bargain - my skin is clearer already! I was hesitant about putting any oils on my combination to oily skin but these two are a treat! Even after insane skinpicking they manage to soothe my skin and prevent the dramatic after events haha. They smell lovely and are very economical. I don't use them during the day though - even the Good skin oil is too oily and doesn't absorb quick enough for me to use it in the AM. Great, great, great addition to any skincare routine. I have redness, sun stains and some acne on my face. This duet has left these three things behind. I am on my second set, and I must say I am absolutely hooked. Also, when I am applying them it feels so relaxing and I often have to just lay down while I'm on the process as it is really an experience. These are the only two products in my routine. They are wonderful! Great duo. Skin visibly improved, it’s brighter, keeps moisture better and is smoother. I’m also using oil cleanser and balancing mist from the same range and they are all brilliant! Love these little bottles. Excellent value. No breakouts and smells divine. I was looking for a budget friendly option for my acne prone skin and thankfully I came across this amazing duo! The good skin does the job of clearing the breakouts and the dreamy skin gently resurfaces the skin. I cannot believe that such amazing quality is offered at that price. Highly recommend! These 2 oils are simply really efficient!! They get your skin glowing, they hydrate and calm the skin down. My skin is dry/dehydrated and sensitive. I will definitely repurchase! Great trial size for an awesome price. Both oils smell like tea tree and lavender. They both have a great consistency and feel lightweight yet effective on the skin. I found myself reaching for Good Skin instead of the Sunday Riley Juno because it's thinner than Juno and sinks in faster. Two great oils which nourish and moisturize the skin without being heavy or irritating. I have been using these oils religiously for about 3 weeks now and the difference they have made to my skin is astonishing. I have acne-prone, oily/combination, red skin and I'd gotten to a point where I just accepted that nothing makes it look any better. Every morning now I wake up to the clear, glowing, hydrated and bright skin. It's given me back some confidence to leave the house foundation free. I had a facial a week ago and the beauty therapist could not stop stroking my skin and say how beautiful it was. I could have cried, I was so flattered! I will 1000% repurchase these in the full sizes when I run out - which shouldn't be for some time as a little goes a very long way! Would absolutely recommend this to anyone who will listen! I can’t believe the price of this product!! It’s 100 x better than my Sunday Riley oil and half the price. So glad I found this little company. Really did ‘sort my skin out’! After trying all and everything...this is exactly what my skin needs. I can actually feel and see how my skin absorbs cravenly every drop of this two amazing oils. The smell is divine and relaxes me and at the same time, I can see my skin transforms into a glowing canvas. The toner is a must and does as much as the oils. It leaves the skin firm and bouncy. Don´t miss out on this amazing products because they are truly incredible. Love that the price is so reasonable (used to use Vintner's daughter and it doesn't come close in performance). These oils are just divine. The ingredients are natural and essential, they smell lovely and leave my skin so soft. This try-me set is great value too. Try them, you won't be disappointed! I have only been using for a few days but can see a difference already. My skin looks clearer and brighter. Think it’s probably the night oil making the biggest difference. Definitely worth a try! Firstly. 10ml I thought was going to be tiny. It’s really not considering you use like 3/4 drops each time, So really good value and great as a duo. Second, my skin has been sensitive and acne prone since my teens and I’ve tried everything. Every brand, every price range & even chemical peel, and nothing keeps my acne at bay. I’ve been oil cleansing for about a month and that’s really helped to keep my skin clear but these two have done that and more. My blemish marks are completely gone and my general texture/pore size & oiliness has improved. Only been using these for two weeks but can definitely tell I’ll use them forever. I never in my life would have put an oil on my face in the day either and now I can. I use hardly any moisturiser anymore either and my skin is glowing. I was nervous that this has a retinol but honestly have had no negative side effects at all! Amazing! I have had acne for most of my life and given that I am now 34, really thought it would have stopped by now. I am prone to cystic acne which even other medication couldn't sort it out totally, along with my skin hating every time I eat sugar (or drink wine). But these have made my skin glowy, soft, balanced and healthy looking as I sit here writing I have no active acne on my face and I haven't said that in years. I wish they did the dreamy skin in a bigger bottle as this is my fave, but both work really well and I cannot recommend them enough. I really enjoyed using the oils, and noticed the brightening, smoothing and really softening effect, and it was amazing...but then came an even clogging of my pores and a giant cystic zit - I've never had one in my life.. I suspect, like one of the other reviewers, the added olive oil to be the culprit.. but hard to say. It's really sad that it didn’t agree with me, since the other effects were amazing. I love glowing skin, but lately my skin went crazy and I was suffering from breakouts. As a result of their treatment, my skin was super dehydrated, dull, with a lot of scars and I was scared of using my old facial oils. I bought this following the good reviews but sceptical and I couldn't be more happy. My skin has improved a lot and now looks wonderful even without make up (scars are still there, but the glow is real). I can't stop using both oils every day. GOOD SKIN in the morning creates an amazing canvas for glowy makeup. Definitely I am purchasing full sizes. Highly recommended!! Been using these little bottles night and day and love love LOVE how my skin is looking. Had no hormonal breakout this month which I attribute to these amazing oils. Will be repurchasing and I am telling anybody who will listen about how good they are. Disciple Forever! I buy this a Balancing mist every month and don’t need anything else. Company motto paid off as I totally sorted my skin out! I love DREAMY SKIN oil. I have been using this for 1 month every single night and I love the results :) GOOD SKIN is great as well but I do not like the smell (tea tree). I suffer breakouts and scarring but this stuff works. It smells great which is super relaxing at night. Really enjoyed adding this to my routine. After two/three weeks scarring reduced dramatically, skin is brighter and appears better nourished. Some scars remain and I still have some bumps on my skin and small spots but they do clear quickly. Worth it. I've been using plenty of different creams, serums, peelings etc, more and less expensive with no result. After using this miracle pair of oils my skin is much more smooth, I don't have any breakouts (which I had a lot on a chin) and it reduced the excess of sebum - after all day my skin still looks fresh. I will definitely buy it again and again. This is so good for acne prone skin..and value for money too. Dreamy skin is the bomb! My title says it all, dreamy skin is incredible. Used it religiously every night and my extremely stubborn clogged pores have shown so much improvement in about two months. Be patient and consistent if you’re looking to clear up your skin - retinol/ retinoids take time to work. Good skin performs alright but it keeps my dehydrated combination skin balanced in the day. All in all, a great kit for troubled skin types to try without breaking the bank. At first I was very skeptical about these two serums. After several days of using these (still using those though), my skin has improved a lot and I am so impressed with that. This is something that I would re-purchase again in the near future. The first products I've tried from Disciple and I absolutely love them. Both smell divine and give your skin a great glow! Also noticed less spot breakouts too since I've been using both oils. Will definitely be investing in the full size bottles now. My wife got me this because she wants me to sort my skin out (I have acne and very oily skin). I have been using this twice a day and love using it and my skin seems less spotty. These were the first products I tried in the Disciple range and it was love at first use - I’m already on my second set. Prefer the good skin mainly because it just smells amazing but the dreamy skin is also lovely. I’ve recommended these to everyone I know. I have a lot of active acne as well as acne scars, and after reading all the amazing reviews I decided to give it try, but it did nothing to my skin and didn't calm it at all. I think if you'd like to try this brand out, this kit is a good start. I've been using it for 3 weeks and it's half of a bottle value. 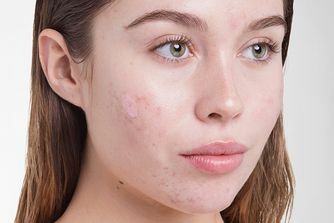 I've used nearly every product aimed for acne that's on the market, but my hormonal acne persisted, but the Good Skin oil from this duo has really helped me clear my skin and the Dreamy Skin has given me an amazing glow and has helped fade scars. I have already put money aside to purchase the full size bottles and backups, and the matching face mist. These products replaced my UFO oil and my Midnight Recovery Concentrate. I hope they come out with bigger sizes (50ml) so I never need to worry about running out. I have combination skin and do not usually use oils on my face. However these felt amazing and I can use them daily without my skin breaking out. The Dreamy Skin calmed my hormonal breakout on bottom chin and redness on my nose . It probably will take longer to see good results on my hyperpigmentation scarring but so far my skin is less sensitive and less oily (on T-zone). I use it as the last step after my daily night regime (cleanser, alcohol free toner, retinol serum, mask, eye cream and moisturiser), I am very surprised how fast it absorbs and leaves my skin soft and little glow. The Good Skin oil (as my last step of morning regime) absorbs quite easily, it does indeed purified my skin and I have less oiliness on my T-zone area despite full make up. Did I also mention my make up last longer whilst looking radiant in the same time? I'm 100% converted as I love everything about them, the smell, the absorption and the result! Thank you for making these high quality products at affordable price! Great value, I got these two tester bottles but you use so little that they’ll last. They both have a very pungent fragrance, very herbal. They are both quite oily but I use them under my face cream. Both oils are really great, best oils I have ever used, and I tried them a lot! Slightly better is, at least for my skin, a good oil, I don't know why (turmeric oil, rosemary oil?). I use both oils in combination with The Ordinary Buffet + Copper Peptides, and it is a great combination. I’ve never commented on anything on here but I felt like I had to give this product credit! I have been suffering from really bad acne for the last year to the point where people asked me what happened to my face. I went to the doctor and he put me on antibiotics for 6 months- cleared it up but 2 months later it was back again. This has done a better job at clearing up my acne that any medication has. I’ve been using it for 2 weeks religiously and it has made a huge difference with active acne, under the skin annoying ones that won’t go away and my scarring! I’m genuinely so happy I could actually cry because my skin was really stressing me out! Both of the oils are incredible! I reordered full sizes and this one for when I travel. I’m obsessed. It ACTUALLY works. I bought this looking for an alternative to my current Caudalie Vineactive Night Oil and Dr. Hauschka Clarifying Day Oil. Especially the night oil of this range is a magic worker. My spots and aftermarks of spots get smaller after every night I use this, normally it takes at least a week. I love the Good Skin Oil in this summer heat we're currently having it is lighter than the Dr. Hauschka one. The only downside for me is the lavender smell of it, makes me want to go to bed rather than start the day. I will definitely be repurchasing the night oil, most likely also the day oil. 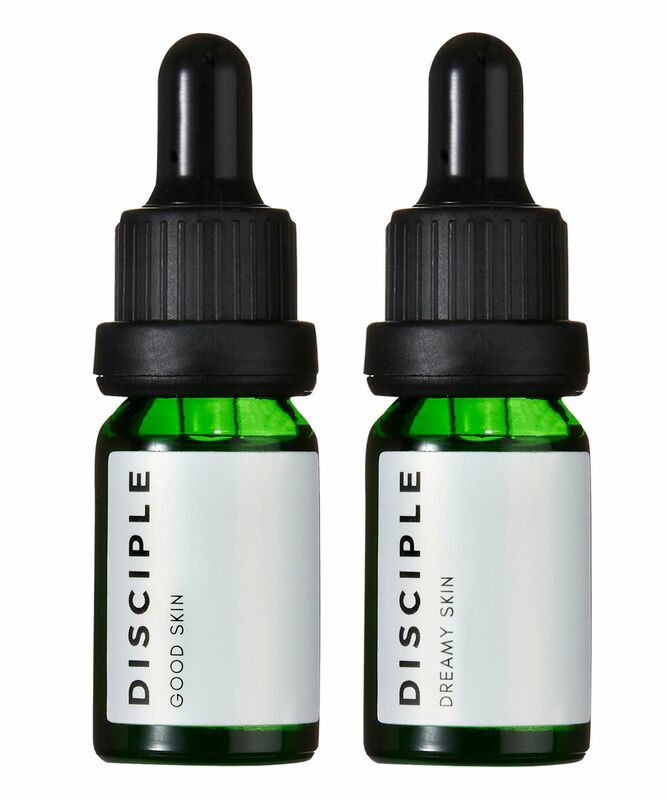 I was interested in using a new facial oil, as I was getting bored with my standard Oils of Life so decided to try the Disciple discovery kit. I have oily/combination skin that's prone to both dryness and breakouts. Both oils are denser than ones I've used before, possibly due to the use of olive oil in both, so I am using a smaller amount (3-4 drops) than my previous brand but both sink in well and leave little residue. I particularly like the night oil (dreamy skin), it absorbs quickly and leaves my skin feeling smooth and soft. My skin definitely looks brighter and more hydrated in the morning. The day oil (good skin) is slightly lighter but also well absorbed. Both leave my skin looking somewhat shinier but also more radiant! So it's a worthwhile trade-off! I expect these to be very hydrating in the winter months, in summertime it may be a little too heavy for some. Both have a nice, natural fragrance to them and are very well priced for a starter kit. The bottles are simplistic and classy. All in all the products feel high quality, despite the low price tag. The quantity goes a long way and I'll probably buy the larger versions once these eventually run out.